Today, I, Renee Ashley Baker, went out shopping in downtown Denver. There is nothing in downtown Denver except the H & M store (H & M moved in when “Nike” moved out. The shopping stores are all in Cherry Creek). Anyway–I needed to buy some equipment (camera & tripod) so I thought I’d look downtown to catch some of the “price specials” in Sunday’s newspaper. 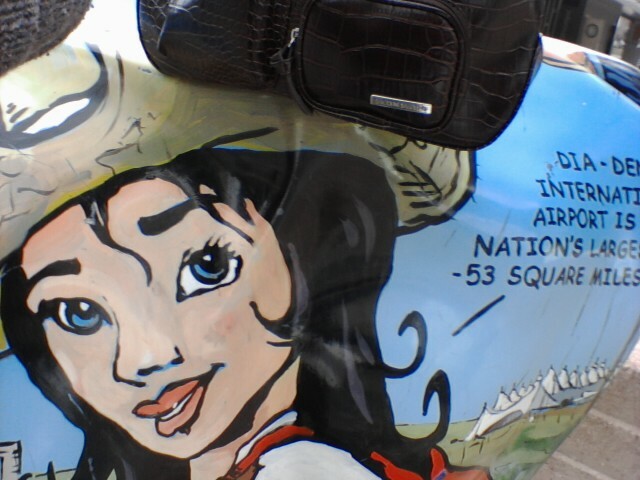 I was walking on the “16th St Mall” and took the above two photographs with my new Virgin Mobile Kyocera Camera Phone. Note on the above: This Cowtown (called Denver) began fighting with me (years ago) when I began doing some work for Senator/Sir Edward Moore Kennedy to read. Now–this Cowtown (called Denver) has the “NERVE” to try and “get money with–and from– Renee Ashley Baker”. Well, I, will never, NEVER allow Denver to “have showbusiness” with Renee Ashley Baker…..So, what are Renee Ashley Baker’s plans? First, I, Renee Ashley Baker, plan to “find a husband” (a Millionaire or Billionaire) using a New York matchmaker. Second, I, Renee Ashley Baker, plan to sign with “Ford” or “Click” modeling agency to work as a “spokes model”. Third, I, Renee Ashley Baker, plan to design handbags and launch a perfume line (hopefully with Tiffany & Co and the owners of Chanel Corp)…. This WordPress Blog is being read in 80 Countries and 50 States…. P.S. The “Office Depot” stores are “crap”. And— “NO” to Grammercy and Still “NO” to Angelina Jolie, No to Julia Roberts , No to Chrlize Theron, No to Pamela Anderson, No to John Elway, No to Tim Tebow, No to CBS, No to ABC, No to NBC, No to Oprah Winfrey, No to Meryl Streep, No to Clint Eastwood, and “NO” to all others that I, Renee Ashley Baker, have previously said “NO” to. This entry was posted on March 18, 2012 at 7:31 pm and is filed under Uncategorized. You can follow any responses to this entry through the RSS 2.0 feed. Responses are currently closed, but you can trackback from your own site.